Lady Lara Croft is on the move again! Tracking the sinister organization known as Trinity – an ancient society that seeks to find and destroy ancient artifacts of great power, lest they be used to corrupt modern society or challenge the official history laid down by the rich and powerful – Lara has come to the Italian village of Cornigila. The city hosts a small chapel to Saint Christopher – the patron saint of travelers – but Trinity believes the church hides a greater secret than that. 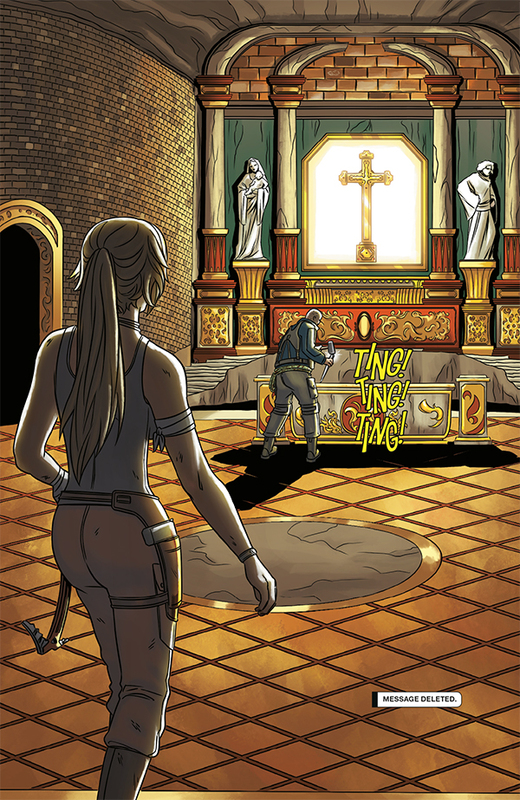 As much as it pains her to see historical artifacts destroyed, stopping Trinity’s destruction of the chapel is not Lara’s first priority. She seeks the name of the Trinity agent who killed her father, whose work as a scholar threatened to expose Trinity’s existence to the world. Lara may have to settle for thwarting their plans, however… assuming she survives! Those who are unfamiliar with the current state of the Tomb Raider franchise – either having missed out on the series’ reboot in 2013 or only being vaguely familiar with the character from the classic video games or the Angelina Jolie films – need not worry heading into Tomb Raider: Survivor’s Crusade. The story by Jackson Lanzing and Collin Kelly (Joyride, Hacktivist, Gotham City Garage) is written to be easily accessible to new readers. 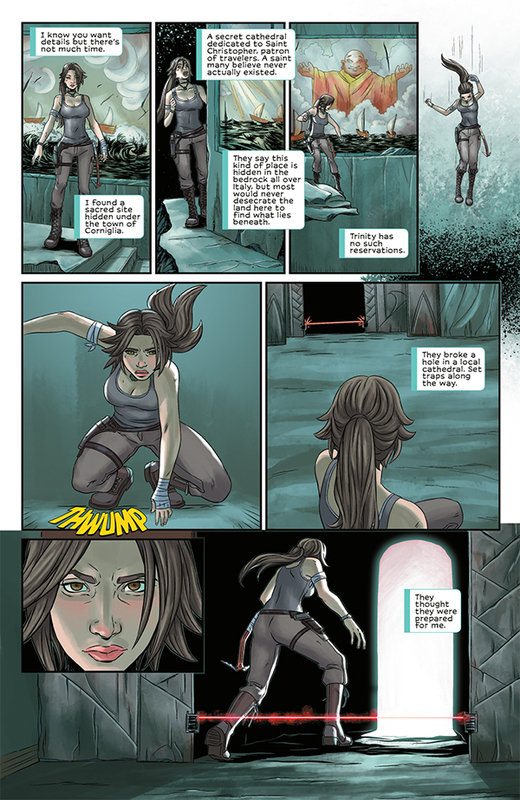 Everything you need to know about Lara’s motivations is explained in the opening pages. Everything you need to know about Lara as a character is shown in the following pages, as we see Lara take on several Trinity soldiers in close-combat. This action sequence does a great job of replicating the experience of playing the game. More, it shows Lara’s skills and ferocity in battle far better than any exposited internal monologue ever could. Unfortunately, this action sequence is also simultaneously the weakest aspect of the book. 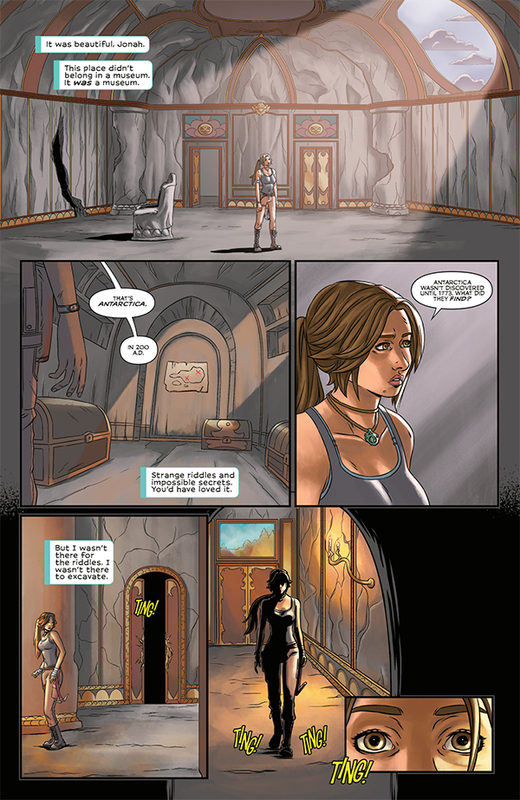 While the artwork for this issue isn’t bad, the art team involved might not have been the best choice for delivering Lara Croft to the comic page. Artist Ashley A. Woods can draw great action sequences with strong female leads, as the series Ladycastle proved. However, with thin inks and limited shading coupled with the light colors of Michael Atiyeh, the aesthetic here seems entirely too bright for the world of Tomb Raider. This light touch results in some pages that look just plain goofy, such as when Lara shoots several Trinity soldiers in the head with arrows. The red on the arrow heads looks like red tempera paint and there’s no blood around the entry wounds. Lara herself is shot at one point and the bullet wound looks like a black dot with some light cross-hatching around it! While Lara herself is well-drawn and the character designs and poses look amazing, one expects more realism in terms of how damage is depicted in something bearing the Tomb Raider name. 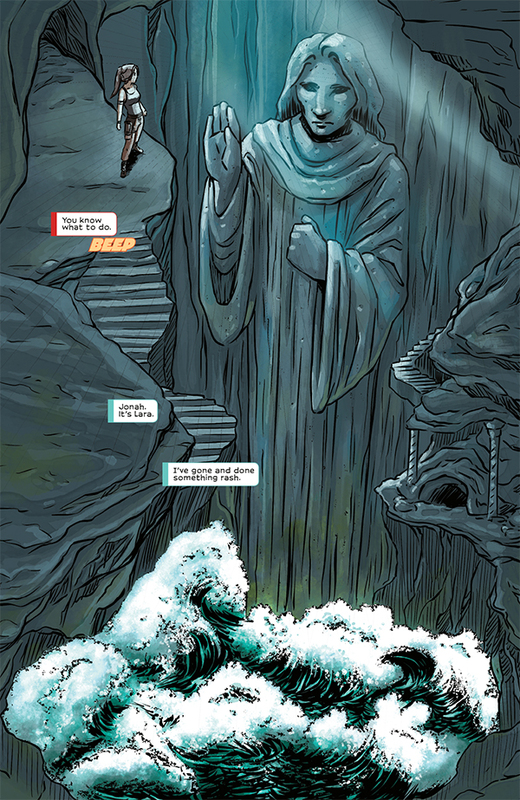 Fans of the games will probably love this comic despite the issues with the art, but this Survivor’s Crusade is unlikely to develop many new fans for the franchise. 5/10. Tomb Raider Survivor’s Crusade #1 is due out November 22, 2017.